There is nothing so calming and peaceful as the sound of gently moving water. If it doesn’t exist in their current environments, members of the St. Louis Water Gardening Society create their own serenity in their water gardens—and once a year, they are willing to show everyone how sweet it is. The 16th annual Pond-O-Rama will be held Saturday and Sunday, June 25-26, from 9:00 AM to 5:00 PM each day. This year 47 ponds and gardens will be featured; 19 are new on tour this year. 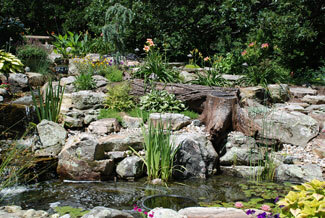 Our members are passionate about water gardening and enjoy working to make their water features a special place to be. If you are thinking of creating a water feature, or you just want to enjoy beautiful gardens, ponds, and waterfalls, then you will definitely enjoy this tour. Our members spend many weeks in preparation for the event, and they are delighted to share their ideas, successes, and their challenges with the public. The water features of our members span the metro area. We are sure there will be one or more that you will thoroughly love! On this year’s tour, there are pondless waterfalls, small-medium and extensive ponds, gentle trickling streams, and quiet gentle waterfalls. Many of the water features include unique plant designs and beautiful koi and goldfish. In the ponds and in the surrounding landscapes are some of the most glorious gardens in the St. Louis area—a pleasure for gardeners and wildlife alike. Birds, butterflies and glorious photo opportunities abound! As always, a part of the attraction will be the blooming gardens and landscapes surrounding the water features and the interesting individual whimsical touches that make each garden on tour special. This year a number of our members are also on tour for the American Hosta Society National Convention tour held here in St Louis. So you know these are very unique water features and gardens! Tour tickets will be available at local retailers and nurseries, at SLWGS meetings in May and June, and by mail through the St. Louis Water Gardening Society website. Tickets are $15 for everyone over the age of 18. The Pond-O-Rama tour supports our community project of maintaining and planting the beautiful lily ponds at the Jewel Box in Forest Park, For information about where to buy tickets, visit our website, www.slwgs.org or call (314) 995-2988. This entry was posted on Wednesday, June 1st, 2016 at 3:53 am and is filed under June 2016. You can follow any responses to this entry through the RSS 2.0 feed. Responses are currently closed, but you can trackback from your own site.